Gregoris Simos is Assistant Professor of Developmental Psychopathology at the University of Macedonia, Greece. 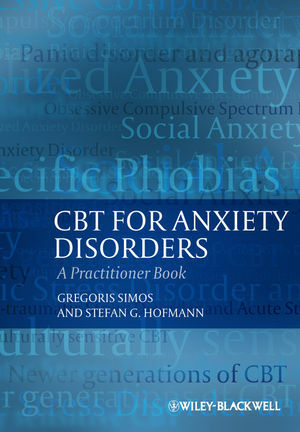 Dr. Simos is the editor of CBT: A Guide for the Practicing Clinician, Volumes I (2002) and Volume II (2009), and a co-founder and President of the Greek Association for Cognitive and Behavioral Psychotherapies (GACBP). Stefan G. Hofmann is Professor of Psychology at Boston University and the Director of the Psychotherapy and Emotion Research Laboratory. He is a former editor of Cognitive and Behavioral Practice, incoming editor of Cognitive Therapy and Research, associate editor of the Journal of Consulting and Clinical Psychology and author of more than 200 peer-reviewed journal articles and book chapters, and 9 books, including An Introduction to Modern CBT (2011, Wiley-Blackwell). He is also the 2011 President of the Association for Behavioral and Cognitive Therapies.